Cawston Parish Church is to receive £221,800 from the Heritage Lottery Fund for urgent repairs. The grant will be used to make the 14th -century St Agnes church weatherproof by repairing the high-level leaded clerestory windows and by introducing a state-of-the-art drainage system to take rainwater away from the building. Some of the funds will also be used to stabilise and monitor the important art works in the church. And the local community will benefit from the creation of a new multi-purpose space, with the aim of making the church a more hospitable place for community events, concerts and meetings, as well as regular worship. The church’s team vicar, Revd Andrew Whitehead, said: “We’re delighted to receive this generous grant from the Heritage Lottery Fund, which amounts to 71% of the total project costs. St Agnes in Cawston is one of the most magnificent examples of medieval architecture in the country, complete with its internationally significant rood screen and angel-adorned hammerbeam roof. 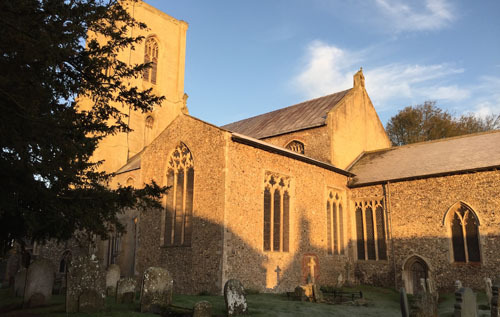 Cawston Parish Church, part of the Aylsham and District Team Ministry in the Diocese of Norwich, has a weekly service with more than 40 regular worshippers. It also holds a a weekly toddler group, a monthly book and jigsaw swap, and a monthly Messy Church for families and children. Worshippers at St Agnes' Cawston celebrating the Heritage Lottery Fund award. Photos: submitted.